Every year some time shortly after Valentine's Day, the big box stores and supermarkets start to fill up with all manner of eggs, rabbits and chicks. 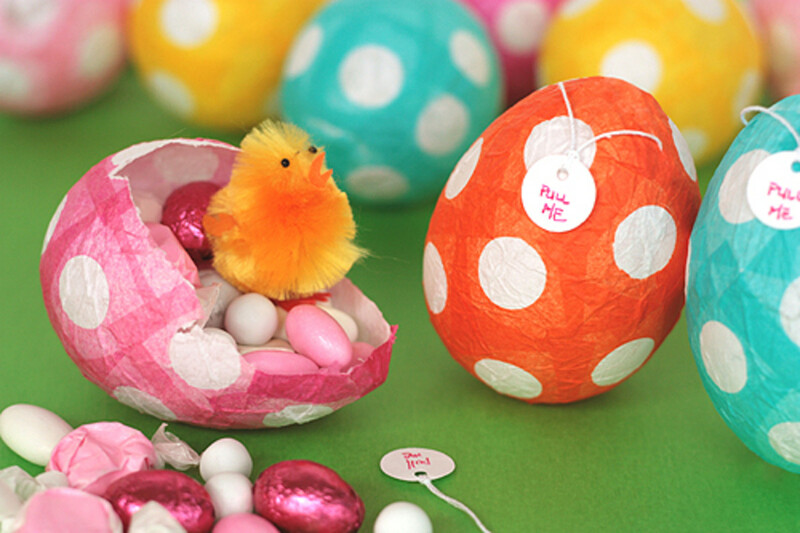 You'll find candies, stuffed animals and plastic eggs everywhere. If you're looking for egg-dyeing kits, these are also available some time mid-February, even in years when Easter falls in April. Just as most children instantly think of Santa Claus when they hear the word "Christmas," they think of the Easter Bunny when they hear the word "Easter. While this very obvious commercialization of holidays is particularly common in the United States, it may also be distressing to Christian parents who are attempting to teach their children about Jesus and the reasons for His death and resurrection. Some Christian parents even attempt to explain the ways that the rabbits and the eggs relate to the resurrection and the sacrifice of their Savior. 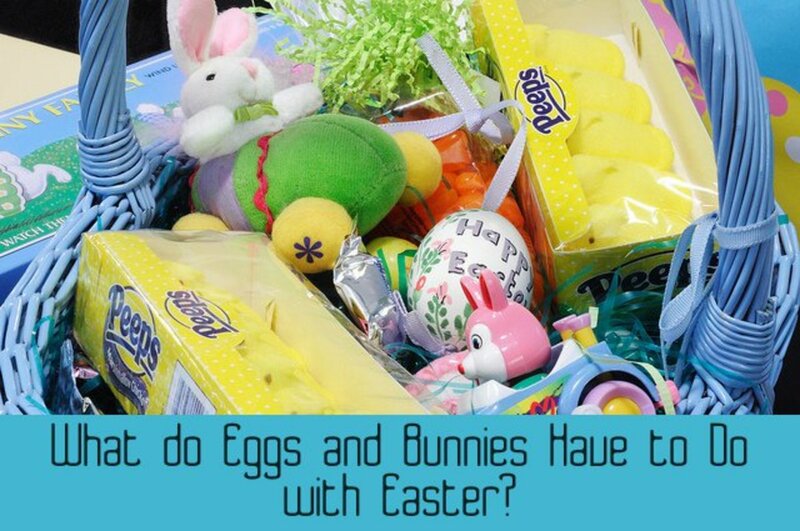 To answer the question in the title of this article, however, coloring Easter eggs has roots both in paganism and Christianity, and Easter Bunnies have pagan origins. 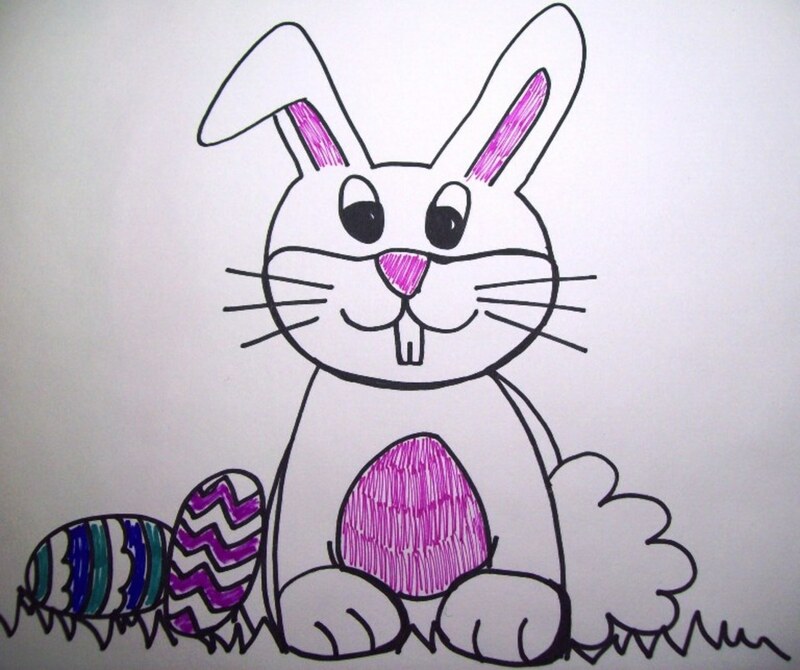 Coloring Easter Eggs is a popular Easter activity for children of all ages. 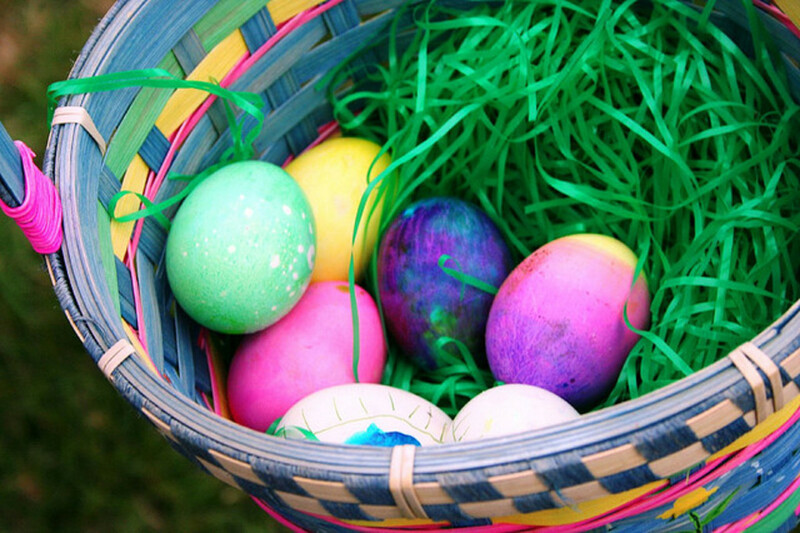 Where did this tradition of dyeing eggs certain colors begin, and where? 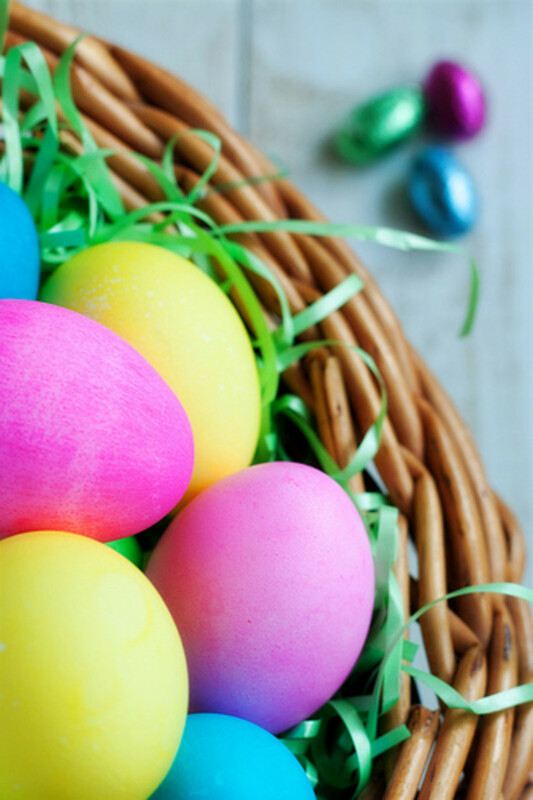 Sources disagree on where the practice of coloring eggs started, but most historians point to the area that is now known as the Middle East, particularly in Mesopotamia and Egypt. 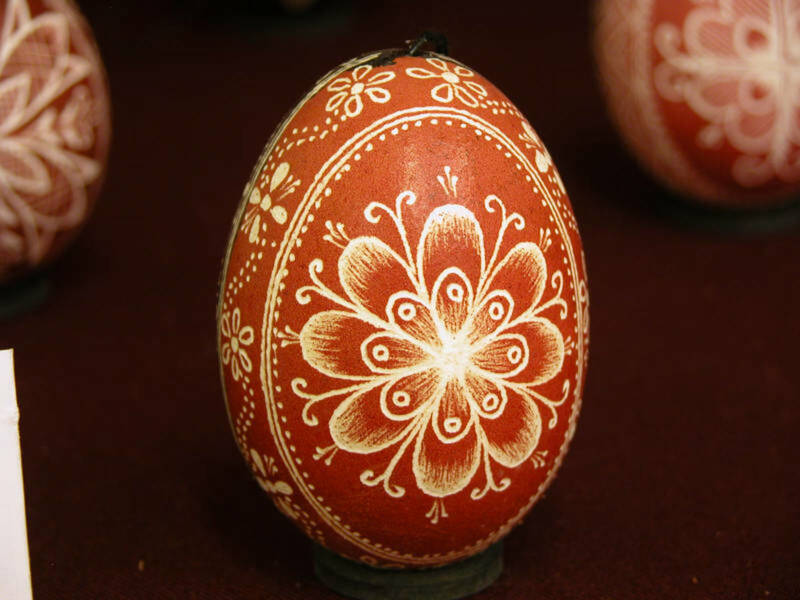 While there appears to be no clear common consensus on where the Easter egg originated, what we do know is that the practice of dyeing eggs appears to have roots in both Christianity and in paganism. Before you criticize a Christian family for coloring eggs for Easter, consider the following. This is probably the oldest origin of the Easter Egg, going back to the early Christian practices. While you will find many articles online that suggest that the Easter egg dates back further than that to paganism before Christ, these articles may be somewhat misleading on the subject of this symbolism. More recent tradition suggests that the Easter Egg is a representation of the empty tomb of Jesus on the morning of Easter Sunday following his crucifixion. This is a more likely explanation for the blown eggs which have had their insides removed before painting. It should be noted, however, that the egg is also part of pagan symbolism going back to before the birth of Jesus. Do you believe that Easter has roots in paganism or that the pagan and Christian Easters are independent of one another? 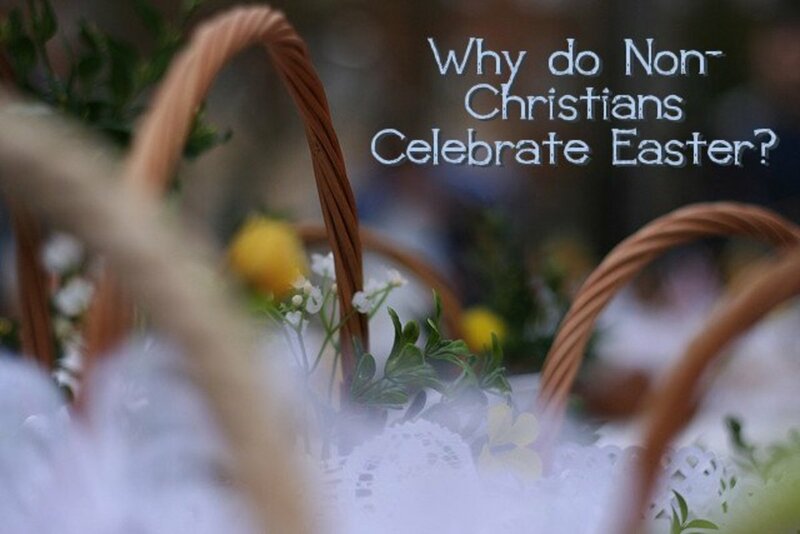 Easter's roots are in paganism and Christians shouldn't celebrate Easter. Easter's roots are in paganism and everybody has an equal right to celebrate this holiday. Easter's roots are in Christianity and the pagan celebration came later, after Christianity took hold in Europe. The Christian and pagan Easters are completely independent of one another and everybody should get to celebrate. By this point, most people know that many of the origins of the Christian holidays celebrated by believers are rooted in pagan tradition. Some evangelicals and fundamentalists go overboard in their assessment of these traditions (many of which are not, in fact, pagan in origin) and you will also encounter some misinformed pagans who like to claim that Christianity stole their practices. Easter eggs are one of the more obvious pagan practices which have become enveloped into Christianity. The question is whether or not pagans or Christians lay claim to the egg first. This is a touchy subject, and opinions differ on the origins of a holiday which is celebrated by members of both religions. The pagan Easter falls at the end of March, while the Christian Easter may be any time in March or April, depending on the moon cycles and positions (because of the Hebrew Passover). Perhaps surprisingly, there are conflicting opinions on who began to celebrate Easter first. While it cannot be argued that the name "Easter" appears to come from the name of a Teutonic goddess (Eostre), the celebration of this holiday is much more recent -- perhaps as recent as the fifteenth century, C.E. The symbolism of the egg may well date to before the birth of Christ, but both religions lay a legitimate claim to the Spring feast. In most species alive on earth, life begins with a "seed." 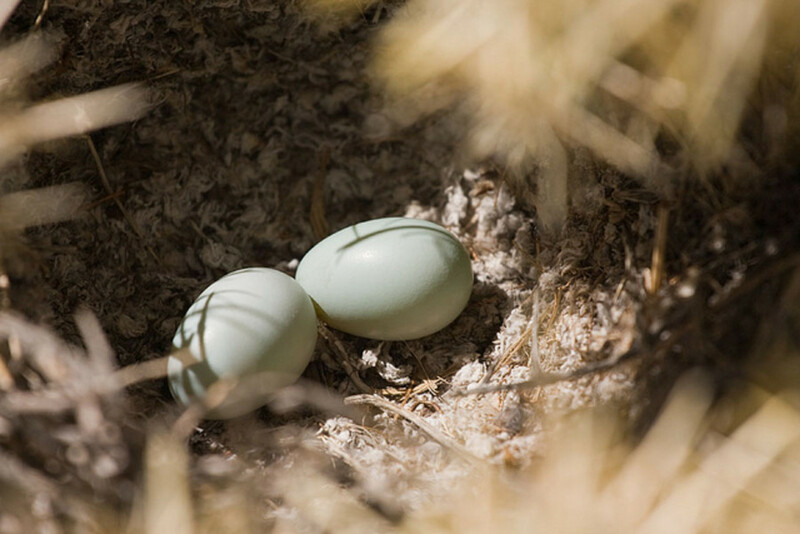 In the animal kingdom, we refer to "seeds" as "eggs." Because life comes from an egg (or a seed), the egg has come to symbolize fertility, and has done for millennia. 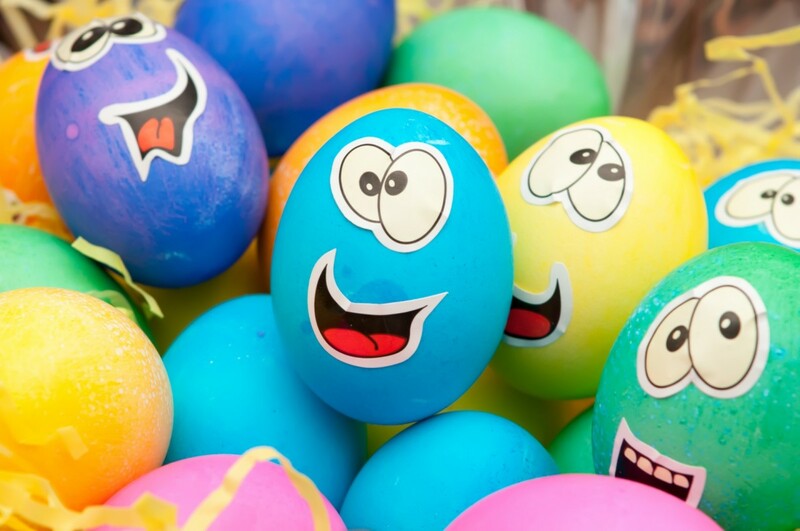 For this reason, many modern pagans use eggs in their fertility rituals, and the egg (particularly the colored Easter eggs) have come to be associated with pagan rites. A wiccan woman, for example, may place an egg beneath her bed if she wishes to become pregnant. The association with eggs and fertility is likely as old as time itself, and for this reason it can be said that one may argue that the practices we associate with Easter has pagan roots. What one cannot argue, however, is that Easter has a significance to Christians as the day when the resurrection of Jesus is celebrated. Pagan - "Breed like Rabbits"
Modern - Lay eggs for children to find. Okay, so What about the Bunny? 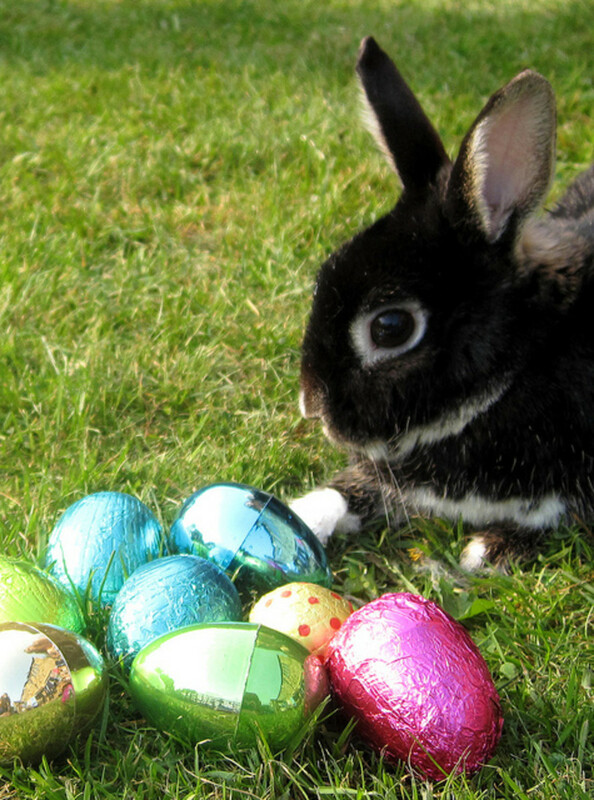 If eggs are a sign of fertility, then so are rabbits. have you ever heard the expression "breed like rabbits?" Bunnies are known for their fertility and their ability to reproduce in large litters which can easily overwhelm the population of an area where they live. 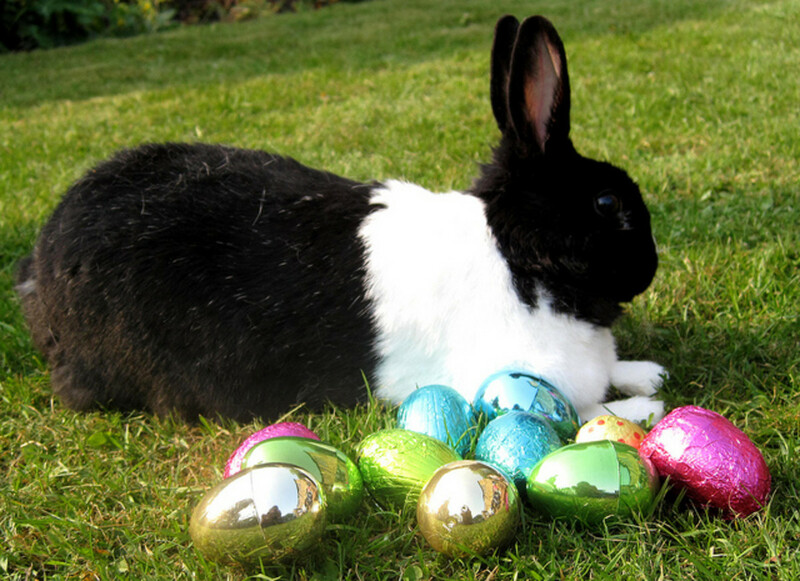 For this reason, rabbits are associated with fertility, and fertility is celebrated in the spring. 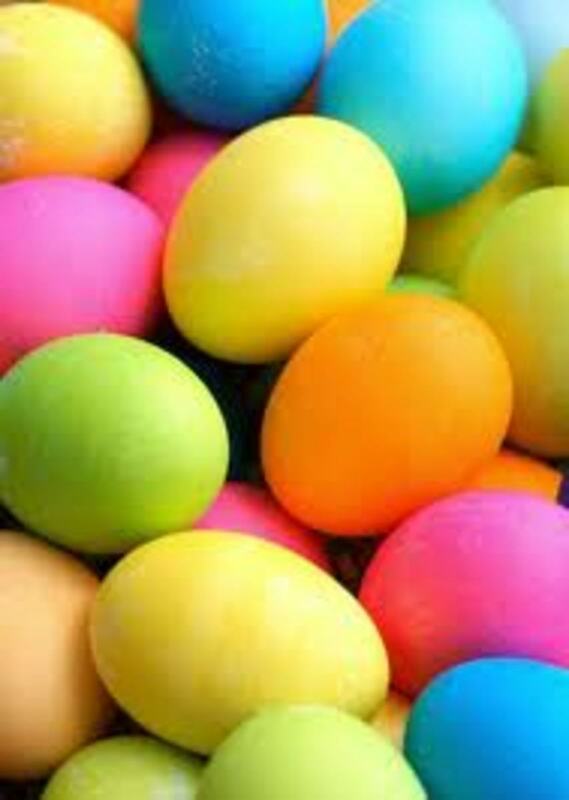 Legend says that the Easter bunny lays eggs for children to find on Easter, and this is why we have Easter Egg Hunts. The bunny lays the eggs in the grass and in hidden places and children must find these to fill their baskets with goodies and treats for the Easter celebration. The egg and the rabbit are also symbols of Spring and of rebirth, signifying a new beginning. For Christians, this new beginning is representative of rebirth in Jesus Christ. Pagans, on the other hand, view this as the turning of the wheel of the year, when winter turns to Spring and everything begins fresh with fertility and new life. Both points are equally valid, and there is no reason why Christians shouldn't paint eggs to celebrate Easter as a part of their religious practice. Different families may choose different traditions, but the Easter Egg has its place in both religious practices. As this article discusses, in brief, issues pertaining to religion, it should be noted that the author reserves the right to delete comments which become contentious for members of other religious groups. Any comments which are belligerent will be unpublished and then deleted in order to spare this page becoming a place for argument and discontent from readers. Be respectful in your comments and comment on the content of the article and you should do just fine! So, when did chocolate come into play? Why not celebrate the death and resurrection of our Lord Jesus Christ patterned after the bible story and the passover? Why take up any pagan practices that were condemned in the Bible? I think our children would learn more of God's plan for us if we taught the real story about the crucifixion and resurrection of Christ. God and Jesus want us to celebrate the Feast days, not the pagan festivals that were renamed and re-symbolized to get pagans to join the church. That way the pagans could still celebrate as they were used to - the symbols were just made to represent something else that would make you believe it was for God and Jesus. It's very difficult to change our traditions - especially when all our family celebrates the current traditions. We partially changed over this year - maybe next year we will do better with more knowledge of the Bible and a better understanding of what it is that God wants us to do. The highest source for information should be the Bible. The problem is interpretations and finding the version that is most closely translated to retain the original meaning. Also, we cannot just go by parts of the Bible - we need to understand the whole Book. May God be with all of us as we sort through information to find the truth and not be mislead by false prophets. Very informative and entertaining at the same time. I enjoyed reading this. Thank you. Thank you very much for stopping by and commenting Prasetio! Very interesting hub and beautiful presentation. I love all pictures here. Thanks for sharing with us. I learn much here. Voted up and Take care! I've done quite a bit of research on the topic of whether or not Easter truly has its origins in paganism, and over the past few months, my opinion has changed repeatedly. This is a very difficult topic to determine because the source is somewhat inconsistent. If you look at interpretations of what Bede said at the time of his writing, they vary (as does almost anything relating to any religion). Personally, I've not made up my mind. While it's obvious that themes relating to death and rebirth have roots in pre-Christian theology (with examples from most major mythologies), this is typical: Christian stories appear to take a good deal from the mythology of previously-existing religions, and there could be a number of reasons for this (I may write on this on one of my other accounts at some point: If you're following pagan topics it should reach you), with the most obvious reason being that early Christianity was "forced" to borrow from older religions in order to welcome practitioners of these religions into their new faith. I am, at least for the time being, neither Christian nor Pagan (as I believe I've stated, but perhaps not) and must confess that as far as I'm concerned, Christians shouldn't celebrate Easter with pagan symbolism. Not because of any misguided notion of "theft" but because their Bible tells them not to associate themselves with pagan things. The obvious problem with this is that these traditions are so pervasive throughout our culture. They are for that reason alone nearly impossible to avoid. Hence part of my own spiritual conundrum. If I am a Christian, how do I continue to obey the Laws of the Bible when culturally these things are virtually impossible to avoid? Even the Amish don't manage to go that far! Hi Becki; The Venerable Bede is really the only source we have for "Ostara"-- and the fact that the word came from the name of the month of April. And that's like, what, 7th/8th century? He believed it was a Goddess but even he said by the time he got there the Pagan celebration was lost in time, and that the people were just incorporating remnants of old spring rites and traditions out of habit. I think they just blended nicely, not necessarily that Christians "stole" holidays the way so many poor NeoPagan sources blatantly claim. 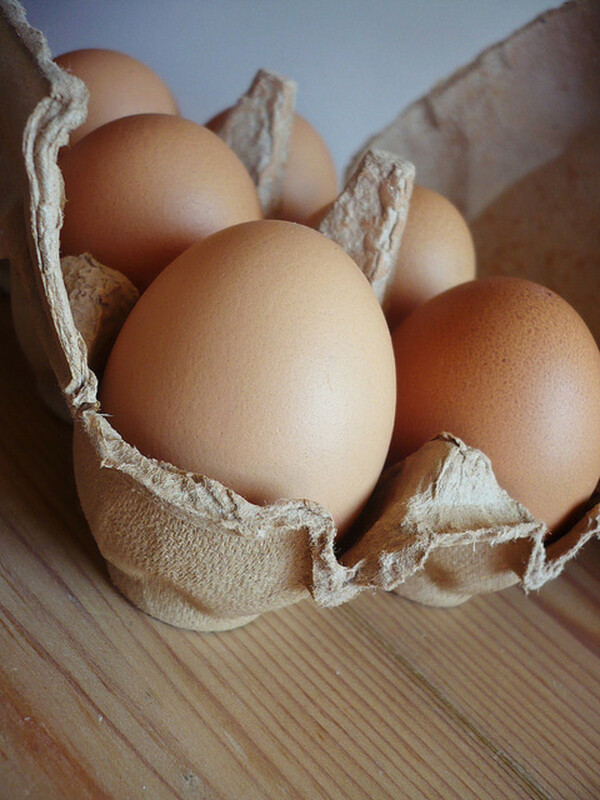 I would not be surprised at all if any ancient Greeks and Romans saw eggs as having some connection to fertility/springtime as chickens didn't really lay them in the winter much so it was definitely something people looked forward to in springtime. I find it hard to believe the idea of eggs being connected with spring can be connected to any single culture or religion. I doubt the Anglo-Saxons were the first to ever come up with the idea. Wicca being 70 years old is really out of the running for being the origin of any traditions, lol. But I can understand your source of frustration, especially when it comes to trying to follow the threads back through history where they've been tangled. I think it's a futile attempt to completely separate them-- I mean, Pagans were simply there first. Funerals, weddings, honeymoons, rites of passage, etc.- It'd be as hard to separate the Pagan influences out of Christianity as it would to separate the Jewish influences, since Christianity was born out of both Jewish and Pagan cultures. These things have their own relevance in Christianity, I think that's what matters. Good luck with finding the answers you seek to bring you peace. Oh! Nice one, Sage! Thank you for pointing that out. I've typically always looked at the symbolism from the pagan point of view, but lines get blurred when you consider the youth of Wicca. Because it's such a relatively new religion, and so many of these practices and symbols come out of Wicca itself, it's very difficult to determine what goes back further than that. 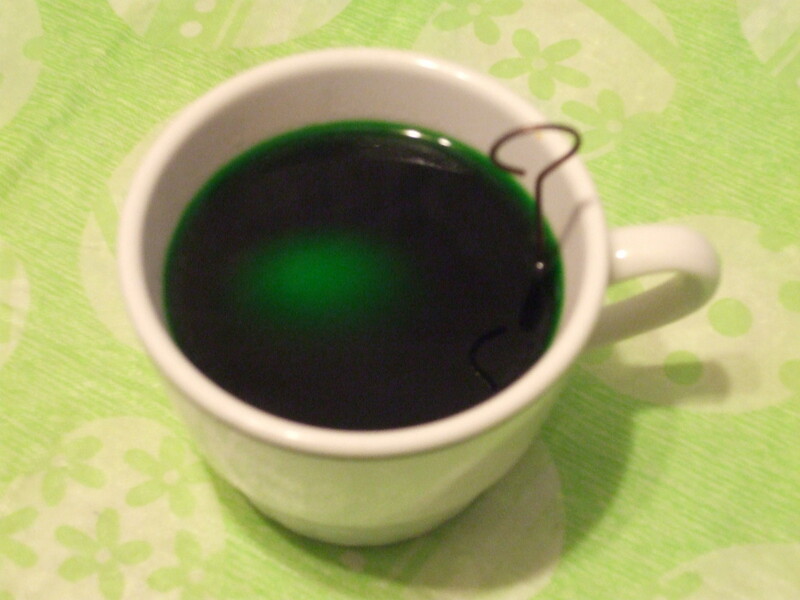 The tradition of dyeing eggs seems to go back to prior to Christ, however, so that's something else that can be taken into consideration. Interestingly, I watched a video earlier that suggested that the Lenten fast has its roots in paganism, too! The video was one of Michael Rood's, and I generally think that he's pretty good with determining the original associations of some of the traditions that are associated with Christianity. This is one of the reasons I struggle so much with Christianity. I've been a Christian for a few years, but I'm starting to re-think my reasoning and have recently become terribly frustrated. Well done article. I tend to believe both Easter and Ostara were probably rooted in more ancient traditions lost in time. But I tend to think that holidays are always evolving and adapting to the new cultures and belief systems. Easter definitely has some Pagan influences, however more modern Pagan celebrations have also been inspired by things that grew out of Christianity. It's all too intertwined to separate, people have to make it their own. Here is another reason for you, though, that connects eggs to Christianity. During the Lenten fast, people ate very little, there was less baking going on, etc. That didn't stop chickens from laying eggs, though, so the eggs began piling up. When the Peschal/Easter came, the sheer abundance of eggs contributed to them being incorporated into the celebrations. So the Christian use of eggs probably would have happened with or without Pagan spring egg/fertililty connections.